Who would assassinate a mathematician? 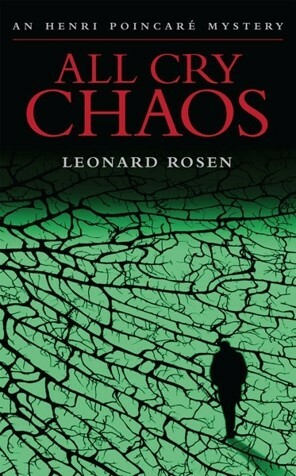 That’s the underlying question in Leonard Rosen’s debut novel, All Cry Chaos. Henri Poincaré, an Interpol agent nearing retirement, is the go-to guy for unusual situations, and the bomb that blew up James Fenster and his hotel room – but nobody and nothing else – qualifies as unusual. Fenster had been about to make a presentation before the World Trade Organization meeting. Who would want him dead? For there is no doubt he is dead, and that he was the target. Also on Poincaré’s radar is Stipo Banovic, a man who was responsible for a massacre during the Bosnian war. Now reformed and a family man, he was brought to justice by Poincaré. Now he faces the probability of spending the rest of his life in prison. He’s not made peace with this future. Nor with Poincaré. Poincaré pursues the Fenster case in a labyrinthine plot that keeps the reader turning pages, marrying a classic murder mystery with the tension of a thriller. Some of the plot points are audacious; the innocent may suffer, good acts can cause misery. Some are touching, as people struggle and sacrifice to keep the world from the chaos caused by greed. All are well-told, cogent, and compelling: Rosen makes the central conceit – that a genius’ mathematical research into the patterns that exist in everything revealed the seminal truth of existence along with the ability to foresee the future – completely believable. The characters in All Cry Chaos are wonderfully drawn, particularly Henri Poincaré, his colleague Serge Laurent, and the mysterious Dana Chambi. Family relationships ring true. In the book’s final pages, Poincaré is a tragic figure redeemed. His fatal flaw – of following the “right” process without examining consequence – has caused him much misery and regret. But he has also grown; by the end of All Cry Chaos, he won’t make those mistakes again. I’m looking forward to more fiction by Leonard Rosen; he’s published many nonfiction (educational) books and his debut novel is an amazing and effective work. If you love a puzzle, you’ll love the book. If you look for great characters, you’ll love the book. And if you want a strong plot, you’ll love the book. Think of Dan Brown, only smarter and believable. So! Now that all five nominees have been read and reviewed, it’s time for the final ranking. Here goes. The MWA Edgars awards ceremony is tomorrow night: Thursday, April 26, 2012. So in little more than 24 hours, I’ll know if the “Literary Lunchbox Edgars” match the actual ones. In 2010, I was spot-on, selecting the winners for both Best Novel and Best First Novel. 2011 had 0% alignment – my picks did not match the judges’ picks. 2012 remains to be seen.